You Want to Get Into Security? 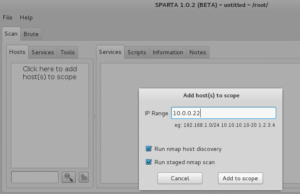 You are here: Home / Blog / Security Standards / Pentesting 101: This is Sparta! 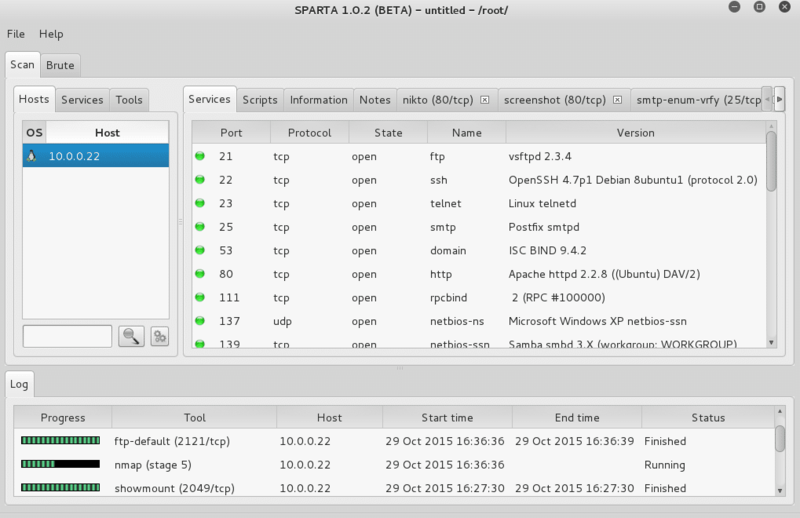 Pentesting 101: This is Sparta! Alright, so I thought that after last month’s thrilling conclusion to our Pentesting 101 series I’d be able to resist talking about hacking for a while. No such luck, folks! This month I want to talk about a slick new (to me, anyway) tool called Sparta, and how it can greatly streamline and simplify the early steps of a penetration test. 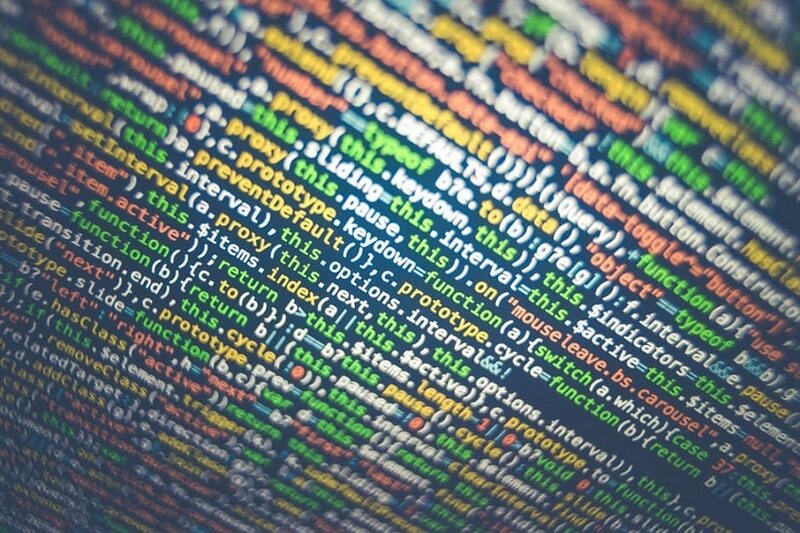 When I first got started in pentesting, I hated when I’d hear seasoned professionals say “Enumeration is the most important part of a pentest.” Why? Because I found enumeration to be annoying and tedious – usually involving a combination of time-intensive tools. Then, even after I had a snapshot of the systems I was up against, it was still rather difficult to document the checking of each port and service so I knew when it was time to move on to the next host. After the Kali Linux distribution updated to version 2.0 this summer, I grabbed a copy and started going through the programs menu and kicking the tires on tools I wasn’t familiar with. Little did I know one tool would bring me immense joy and time savings in the enumeration department. 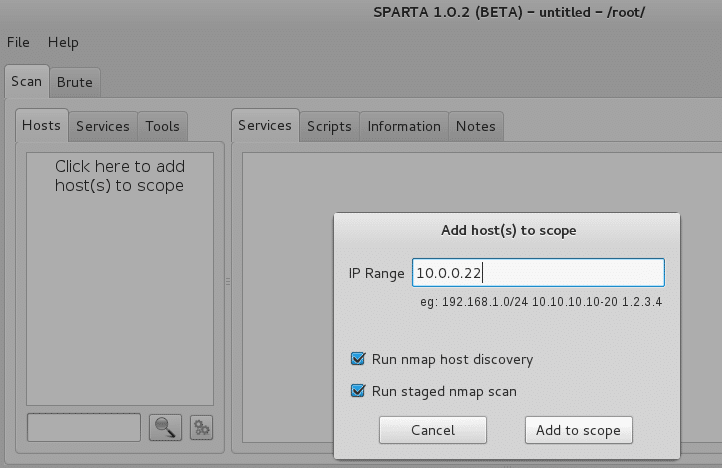 When Sparta opens up, click where it says Click here to add host(s) to scope and then type in a single IP address, or you could enter a whole subnet, such as 10.0.0/24. For me, I’m going to use the Metasploitable VM for the purposes of this demonstration. Again as a quick reminder before we proceed, these kinds of tools should only be used on systems you own and/or have permission to scan and exploit. For me personally, I can barely even do this kind of stuff on my home network. One time I ran some scanning tools against my AppleTV and it briefly interrupted my wife’s viewing of Downton Abbey. Yeah, it wasn’t pretty. I slept on the couch for a week. Sparta will start doing enumeration against the host. As it finds open ports and services, it interrogates them for version numbers, and even runs some additional scripts used to check for low-hanging vulnerabilities (this is probably my favorite part – I love that Sparta automatically does some work I would have to do manually later!). When all the scanning and scripts are run, you will see a nice breakdown of the host’s services, complemented by tabs for each open port across the top. Lets click the nikto tab and explore that a bit. Nikto is a Web scanner that checks for thousands of potentially dangerous or sensitive files and programs, and essentially gives a Web site the “once over” for a large number of vulnerabilities. Review the Nikto output in Sparta and investigate any interesting findings. For now though, lets move into the ftp-default tab. It looks like Sparta identified an FTP service running, and has even tried a handful of default credentials – and struck gold! Seems pretty straightforward – lets type set rhost 10.0.0.22 and hit Enter. Then type Run and hit Enter to launch your exploit! You’re winning – you now have full control of the machine. Now’s a perfect time to click the Notes tab and document the steps you took to takeover this host. For the fun of it, lets try owning the machine another way. Now type run and hit Enter to let the fun begin! Uh oh. Remember in an earlier part of this series when we figured out we were running as “root,” which is a user with administrative-level privileges that lets us do anything we want? Well in this case, we are a user called tomcat55 which has limited privileges. Hrmm, so what can we do to escalate our privileges to have more rights? Join me next month and we’ll figure it out together! Sometimes getting your initial foothold into a system is just the beginning of a battle during a pentest. Next month we will talk about some of the automated and manual ways you can escalate privileges and gain total control of your target system. FRSecure is a full-service information security management company that protects sensitive, confidential business information from unauthorized access, disclosure, distribution and destruction. https://frsecure.com/wp-content/uploads/2016/05/information.jpeg 556 834 FRSecure https://frsecure.com/wp-content/uploads/2018/05/FRSecure-logo.png FRSecure2015-11-18 19:59:282019-03-18 14:51:09Pentesting 101: This is Sparta!